Lemons are a very versatile fruit. They may be used as seasoning for other foods or used in lemonade and other fruit juices. According to herbs2000.com, eating lemons may ease the acidity in your stomach when eaten regularly. One lemon without the skin is equivalent to one serving and contains 17 calories; two of these calories are from fat. One serving of lemon with the peel contains 22 calories, with three of these calories from fat, according to FatSecret. 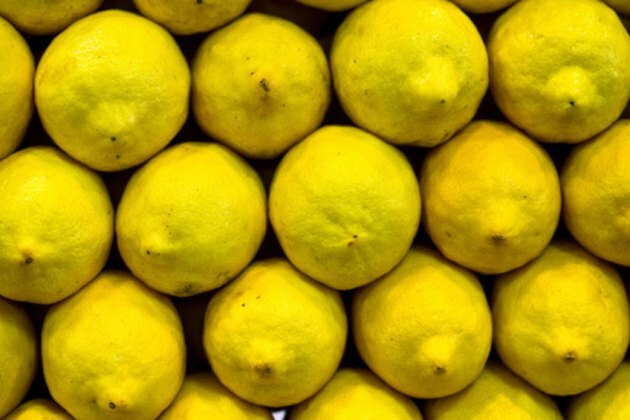 Lemons, peeled and with the skin, are good sources of vitamin C. One lemon with the peel contains: 139 percent of the daily value, or DV, of vitamin C; 7 percent of the DV of calcium; and 4 percent of the DV of iron. One lemon with no peel contains 51 percent of the DV of vitamin C, 2 percent of the DV of calcium and 2 percent of the DV of iron. The lemon does not contain any cholesterol. Each serving of skinless lemons contains 80 mg of potassium, 5.41 g of total carbohydrates, 1.6 g of dietary fiber, 1 mg of sodium and 1.45 g of sugars. One lemon with the peel contains 157 mg of potassium, 11.56 g of total carbohydrates, 5.1 g of dietary fiber and 3 mg of sodium.